The Tiny Librarian: Eat, Drink, and Be GREEN! Eat, Drink, and Be GREEN! 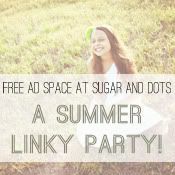 Today's post celebrates green...my favorite food and drink color! I love salad greens, green veggies, green smoothies, greens in soups, and most importantly, green tea! For dinner, I made a delicious and hearty lentil soup, which is easy peasy to prepare! I also have been making a pitcher of green tea each week to ensure that I am consuming a daily dose of antioxidants in a healthy, refreshing beverage. Now, onto the lentil soup experience using a combination of lentil soup recipes. This post is a little late because my mom and dad invited Sooper and I over for delicious shrimp salad (not for Sooper who is allergic to shrimp) and lasagna last night, which is when I planned on preparing the soup. So, today, I made the lentil soup and decided to feed mom and dad. I am definitely their favorite daughter. :) This time, I remembered to document the preparation of the soup along with the finished product. However, I noticed a few interesting things with this soup along the way. First, there must be a white onion shortage, because I went to Whole Foods, and there were NO white onions. Then, I went to a local grocery store, and they had a very limited selection of white onions, but I scooped up practically the last two available white onions. Who knew I would have to stock up on white onions, my usual onion choice because of the mild flavor for Sooper who is particular about too much onion flavor! Second, looking at the images, I realize that I always place a cutting board on top of the free standing cutting board. This seems a bit weird, but it may have something to do with my crazy cleanliness! 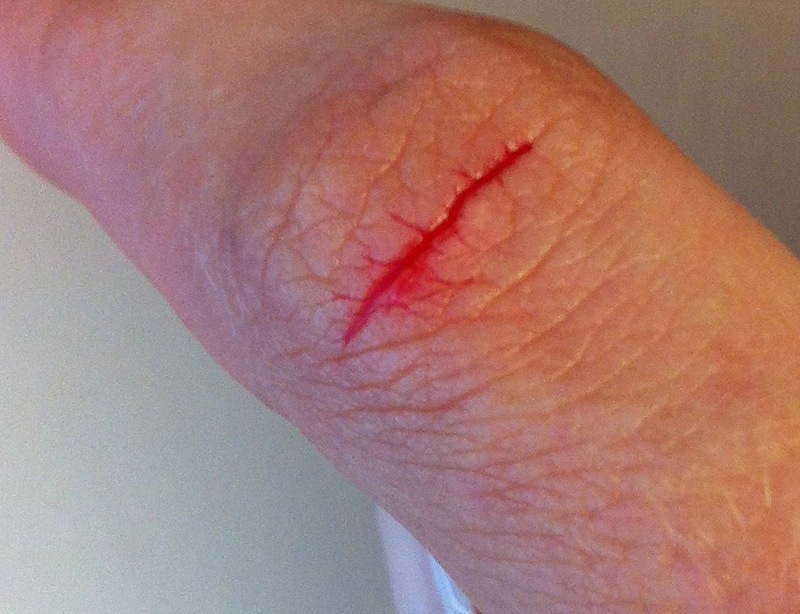 Also, while cutting the carrots, I must have mistaken my finger for a carrot, given the similar shape, and tried to slice it. Yikes...it hurt a bit, but other than some bloody carrots, everything turned out great! :) Thank goodness for the boiling process to kill any germs (to all those who ate the soup, just kidding). Using our very colorful bowls, I chose the particular chopped/diced ingredient for each bowl. Soak the lentils in hot water for 20-30 minutes. While the lentils are soaking, saute the onions in 2 teaspoons of EVOO until they are translucent. Add cumin and garlic and saute for another minute or two. Add the carrots and celery and saute for 5 minutes. Then, add the vegetable stock or broth and drained lentils. Bring the soup to a boil. Lower the heat and summer partially covered for about 1 hour or until lentils are soft. Add salt and pepper to taste (In my opinion, you will not need to add salt, given the amount of sodium in the stock or broth). I love the taste of green tea. My favorite green tea is The Republic of Tea Daily Green Tea: The People's Green Tea. I buy both the caffeinated and decaffeinated variation of The People's Green Tea, and Sooper seems to like when I drink the decaf version, especially since I am already quite a bit active without the caffeine. :) Usually, I make a pitcher and combine 10 decaf bags with 2-3 regular caffeinated bags...a WIN-WIN! Green tea is the best source of catechins, which are considered to be more powerful than vitamins C and E in halting oxidative damage to cells caused by free radials. They also appear to have other disease-fighting properties. Studies have found an association between consuming green tea and a reduced risk for several cancers, including, skin, breast, lung, colon, esophageal, and bladder. In addition, because green tea undergoes less processing than black, it contains twice the concentration of these catechins. no matter what, it is good for you! A glass a day keeps the cancer away! 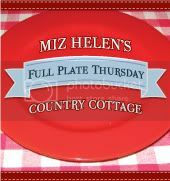 Miz Helen's Full Plate Thursday, a little nosh, Amy @ SS&GF for Slightly Indulgent Tuesday, and My Sweet & Savory for Meatless Mondays! White onions are really hard to find right now, and they're extra pricey! 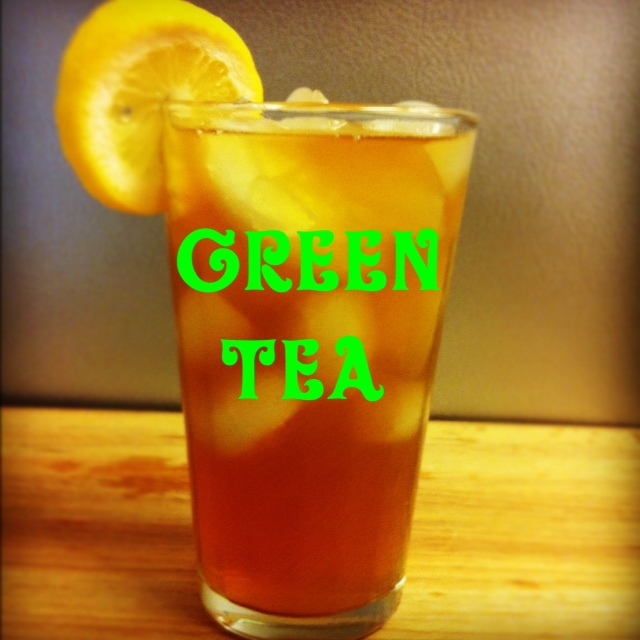 I love green tea; I'm going to steal your idea of making a pitcher a week. That'll make me drink it more often. Thanks! Your Soup looks awesome, so sorry about your finger, I hate it when I do that. I love green tea and have it often, it is so good for you. Hope you have a great week end and thank you so much for sharing with Full Plate Thursday. My dad is totes awesomesauce!